Looking back, Easter and other holidays were always fun occasions. The family usually got together for a home cooked meal at my grandma’s house and visited for hours. Christmas and birthdays were also the best holidays as a kid. The anticipation of opening gifts and having the neighborhood kids come to my house to eat pizza and cake for my birthday were some of the best days ever! The best cakes were the ones my grandma baked. Chocolate marble topped with chocolate whipped cream was my favorite cake! Although my grandma just bakes here and there for fun, my mom took over some years back. Even though the holidays aren’t as spectacular as they were 20 some years ago, my mom bakes excellent cakes and cupcakes from scratch for most holidays! Her red candy apples she makes from scratch are amazing too! They’re the good kind that don’t get stuck in your teeth. Going back to my birthday, there’s good and bad news about it. The good news is nobody really forgets my birth date after 2001. The bad news is that it’s on a tragic day for America, September 11th. Luckily, my family and co-workers try to make the day extra special for me and they always do a good job! if you ask any American about September 11th, 2001, they’ll be able to tell you exactly what they were doing on that day. People from other countries may also be able to answer the question. Christmas Day now and back then still consists of the family getting together to eat the tamales me, my grandma and mom make every year. We usually get help from other relatives like my sister if she’s in town. Yes I know I got a little side tracked with other holiday memories besides Easter but I also remember the fun times then. Me, my mom and sister used food coloring or egg dye to color/paint hard boiled eggs and cascarones. Cascarones are empty egg shells filled with confetti. They usually sell the confetti filled eggs at Walgreens and/or Walmart nowadays. We would dip the eggs/egg shells into blue, yellow, red, green, pink, orange, purple and yellow dyes. You knew someone was painting eggs the day before because their fingers would still be blue, green or red. After the eggs dried, we added the confetti into the egg shells. We then glued a tiny slab of tissue paper around the small opening of the egg. Besides painting the eggs, the fun part was having an adult relative hide the eggs around the front and back yard and finding them! As the eggs were found, BAM! Everyone would have a confetti-filled egg broken on the top of their head. The confetti would take days or sometimes even months to get rid of in the yards. The happiness and excitement everyone felt made it all worthwhile. Wearing pretty dresses and shoes to church was also a big deal. Opening up a candy and toy filled Easter basket in the morning was always fun too. I always liked (and still do!) the red and green cherry and watermelon jelly beans and chocolate bunnies. The black jelly beans and overly sweet marshmallow Peeps are still a NO for me. Although my son painted a few eggs with my grandma this year, he’s growing up every single moment. He’s not that interested in doing it anymore. This year, he enjoyed the Lego sets and Ninja Turtles book in his Easter basket the most. Although we went to an Easter egg hunt this afternoon, it was disappointing. I know my son still hasn’t grown up just yet because he cried when the other kids and their family members became greedy. They grabbed as many eggs as possible. There was no need for pushing and shoving either. My son ended up taking one egg home out of the 10,000 that were supposed to be there. We should be showing our kids manners and respect, even in 2015. In recent years, I’ve come to realize holidays are for kids and those who are very young at heart and that’s ok with me. They obviously have religious meanings to some but not all. I continue to celebrate them for my son and the happiness it brings him, just like my parents and other relatives did for me. I am not much of a church goer for my own reasons but that does not mean I don’t have faith in God and Jesus either. P.S. 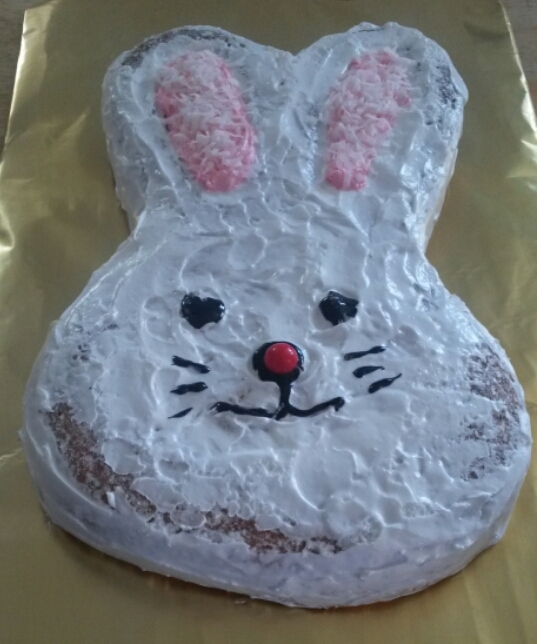 My mom’s bunny cake above was delicious as usual! Previous Spring is Finally here in El Paso! WHAT? OMG! I am so sorry! Jesus Christ! How horrid! Oh yeah that’s right (about Princess Diana, Mother Teresa dying in September). Oh my gosh, that’s so sad, I’m really sorry about your baby niece. It’s even more sad when a baby or child passes away. I’m sure not a day passes that you don’t think of her. You should remember your birthday because you’re you and you came into this world. I love candy and cake any day, not just on special occasions. Aww thank you! No they aren’t perfect ha ha but they bake and cook very well. They both taught me so much though. Making the tamales are a lot of work but it’s bonding time and worth it. It wouldn’t feel like Christmas if we didn’t do them. Your Grandma’s cake! Your Mom’s cake baked from scratch! Cupcakes! Candy apples! Your birthday’s still good no matter what. TAMALES! OMG! HOMEMADE TAMALES! Cascarones! Never heard of it! First time I have heard about it! Looks like fun smashing it on somebody’s head! I’d be smashing it on all 4 of my brothers! Easter egg hunt. Yeah, it happened to my nephew. Oh, he cried his eyes out but I helped him get over it quickly. Stupid parents! Yes, I saw the BUNNY CAKE! Gosh! What a perfectly lovely family you got! A lovely Easter day!